The Deathwatch is the ultimate weapon against the myriad alien races that threaten the Imperium of Man. Drawn from many Chapters of the Adeptus Astartes, the elite members of a kill team come together to form a lethally efficient squad of warriors capable of cleansing entire worlds of xenos infestation and corruption. 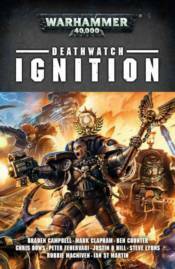 As Chaplain Ortan Cassius becomes entangled in the insidious Ghosar Enigma, he turns to the legends of the Deathwatch to find the most worthy of his brethren. The Space Marines that will go on to form Kill Team Cassius have faced diverse and deadly challenges at every turn; each has his own story, each harbors his own resentment of the foe, and each has his own method of ensuring its ultimate destruction!